Not that my job is the least bit hard, because really lets face it, it’s very easy to make fun of a show like this. The jokes practically write themselves when a bunch of self-absorbed narcissists get together on TV and try to pretend they’re looking for their future spouse. And over the years, I’ve most certainly gotten my fair share of insider information. However, as much information as I’ve given out on this site that you never see make it on the show, there’s still soooo much info I never mention. I’ve got stories galore, but to protect stories, there’s a lot I just can’t share. Seriously, lets just take the last three seasons for example, I’ve gotten either an email, text, or heard something not the least bit flattering about the following people: Becca, Amanda Stanton, JoJo, Jubilee, Caila, Jade, Juelia Kinney, Olivia, Lauren Bushnell, Leah Block, JJ, Ben Higgins, Ben Z., Cupcake, Joe Bailey, Jonathan Holloway, Joshua Albers, Nick Viall, and Shawn Booth. Most of which I’ve never shared. Point being is that I get stuff all the time from random people who paint these people in a completely different light than what you see on TV. It’s scary some of the stuff I’ve heard. Before I get started just a quick reminder to get your “Reader Emails” and “Dr. Reality Steve” emails in this week. Because of no new show this week, the email bag is pretty light. Although maybe after you read today, things will pick up. Anyway, get your emails in and we can begin discussing what the world is calling JordanGrant Gate. Ok, fine. I just made that up. For the last two months, I’ve been telling you this season is all sorts of f****ed up. I was talking about the guys, the things I was hearing, and then coupling it with how JoJo’s season plays out. It’s all just one giant mess. But again, it’s tough for me to prove a lot of things without outing sources, and that’s just not something I do. But in examples like these, I can update you on a few of the things that have come about this season. Never in my over 10+ years have covering this show, have I EVER had this many ex’s or friends of ex’s write to me about contestants on the show. Ever. It’s unheard of. The closest was Arie who had a couple come forward, and I printed those. But these were pretty excessive, detailed, and they wanted their stories out there. Do I share? Do I not share? What’s the protocol for something like this? Well, there really isn’t one other than this is my site, and it’s my judgment call to make on what to do about what I’ve received. And this time, having gotten so much information, and detailed information at that, I’ve decided to share it. These emails focus around two guys in particular, and that’s Grant Kemp and Jordan Rodgers. Most of the time I’ll get an email here and there saying “Oh, I know so and so and this is what I know about them” yada yada yada and I basically just store it to memory. Hence the reason you never really heard me dish a ton of negative stuff about all those names I mentioned in the first paragraph. I could tell you stuff that would blow your mind about almost all of them. But because it’s not really something I can prove, and also not something that ultimately affects the outcome of the show, I usually let it be. Of course here and there I’ll throw stuff in (like Caila applying while still having a boyfriend last season), but really the only time I’ve come out and reprinted story after story with emails was with Arie. And his post show skirt chasing of women within the franchise, along with the early 20’s girls he loves so much, proved him to be exactly what the emails claimed. These Grant and Jordan email, to me, are relevant. Did these guys commit crimes? No. Are they the most horrible human beings on earth? Not at all. But in the context of this show, do I feel THIS many ex’s coming forward and sharing stories about them warrants not only your attention, but the attention of girls within the franchise? I think so. This has nothing to do with becoming a gossip site. Trust me, if I wanted to be a gossip site, I would be. I could post something daily about a contestant from this show and could probably do it every day for 365 days a year based on stuff I’ve heard. You know me, and you know this site gives you funny, insightful recaps, it gives you spoilers to the Bachelor/ette, and Bachelor in Paradise that no one else gives you, and on occasion, I will delve into behind-the-scenes stuff that you don’t know about. Today is one of those days. Some of you will read these emails today and your exact response will be “So? This all happened before the show. This doesn’t matter.” And you have every right to think that. I think it’s highly naïve and you’re living in fantasy land if you think this doesn’t matter, but sure, you still have a right to think it. And to the notion that, “These ex girlfriends are just jealous. They want to capitalize on fame,” that wouldn’t quite be accurate either. None of the emails you see today will have names in them because all the girls requested not to be named. The only name mentioned is Grant’s latest ex, Jen, and that’s because it was her friend who decided to put her name out there in her initial email to me. I’ve spoken with each one of these emailers and verified who they are and their stories being legit. This isn’t made up by any means. These were the actual emails I received from ex’s or friend’s of ex’s of Grant and Jordan. You can take them how you will. I just know if I were a girl, and I was either about to be involved with Grant or Jordan or was currently involved with one of them, I’d want to know this stuff. But hey, that’s just me. I have to say I feel kind of naive for being shocked that Jordan has been back on this dating app AFTER filming. You would think he’d lay low until at least ATFR! I don’t mean to be offensive, but I have yet to see what is so charming about Jordan (or Grant) on the show. When Jojo asked Jordan for validation at the pool party, she was eating up his response without hesitation. To me, he responded like a high schooler without an ounce of genuine intent. I’m not an old/wise soul. I’m in my 20’s. The only thing I can think of is that these women, including Jojo, are drawn in by his name and what they believe to be his status. But maybe I’m too realistic and/or judgmental so I don’t get it. Some of the stuff you’ve heard about the people on that list is “scary” but you can’t tell us? Come on, Steve. I hope you didn’t wake the bad-boy player sympathizers. Anyone who leads another person or multiple people to believe something when it’s nothing but an ego-boost is a d-bag. Screw around if you want to lead that single life, just be honest about it. Don’t screw with people emotionally. Shocker!? Are people really surprised that a very attractive Vanderbilt scholar is playing the field? His own father was taped saying that Jordan was clearly out to land a sports commentator gig and that was when Caila was supposed to be the Bachelorette. I found the emails comical – he didn’t do anything that most hot guys in their twenties do. Where’s the bombshell? Welp. It sure will be comical on ATFR either way. I have to agree that in the general scheme of life events, a couple of guys cheating on some gullible girls is pretty commonplace. And the girls (and yes, I use that term deliberately) that kept taking them back just proved that they would take anything, if the guy was attractive. People treat us the way we ALLOW them to treat us. Each of those girls made their choices. I really can’t dredge up much sympathy for any of these people, as that’s going out to the folks in Orlando right now. Its sad that the behavior of Grant and Jordan is not so shocking to me. Ive had THREE friends within past few years that have all had the guys who they were seriously dating, either admit they were married, engaged OR getting engaged. You would think in the age of social media these guys would be afraid to live double lives, but nope, douche bags have zero fear. No, i dont think any of these girls are to blame. yes, they failed to read the signs and ignored obvious red flags because of love/lust/desperation, BUT that doesnt mean they deserved what they got. In the end, if you ask a guy point blank if the two of you are exclusive and he says yes, you have no choice but to believe him and try to make it. Its unfortunate that we have to be so skeptical of everything and everyone. Losing a bit of respect for Jojo based on who her final two are. The type of guy she is attracted doesn scream commitment. to She’s either not ready to be married and is doing this just for fame OR she’s naive, in which case, she definitely shouldnt be gettting married. Cant feel sorry for her. She had opportunity to research Jordan prior to the show and was blinded by his abs and potentially high profile status. I don’t think the emailers asked for sympathy. I am however glad they came forward. Their choices, their lives. I also do not sympathize with Jojo as it was clear she honed in on the “famous” one. It is even more apparent to me they were in contact prior to filming. I guess Jojo shouldn’t have played games with her ex Chad only to dump him when she got the gig. Now that these exes have thrown a wrench into things, I wonder if the showmance carries on, or tptb plan a breakup special. I logged, read the headline and immediately set up for some juicy gossip. Instead what I found was a kind of she said/she said that doesn’t really interest me. Why would you trust any guy who goes on this show anyway? There are maybe 2 or 3 guys/girls on any one season who are there for legitimate reasons. First notice Steve seems to assume JoJo is serious about this guy. If the stories about her ex-Chad are true, she and Jordan may be like two peas in a pod. If she’s in this to build her brand, how sad if she were to choose a Right Reasons guy. He would be hurt just like Whitney was by Cris Soules. Maybe hope she can get her exChad back. We don’t know enough about her real situation to give good advice though. I largely agree with Kimmy. The one thing that was a bit juicy was the alleged fact that Jordan supposedly reactivated his online dating account & started looking around. But, no screen shots are provided (that would have been something) with an explanation that screen shots would get them banned. Maybe. I don’t know how this all works, but I’m not sure an app would have the ability to even know when a screen shot had been taken. Feels a little fishy. You’d have to fully trust that there is more info that wasn’t revealed that would validate this accusation. Anyway, it turns into a she said/he can’t say type of thing. Very one sided. Someone with an ax to grind, say an ex-gf (oh, they’re never bitter), could say whatever they wanted. There are always two sides to any story and we’re only getting one side. 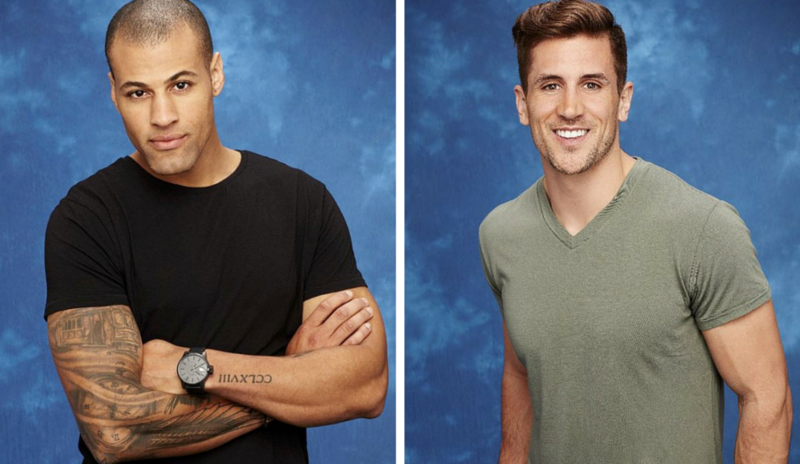 So, I’m not saying that Jordan and Grant aren’t players or saying they’re great guys. Grant certainly had some overlap of his long term relationships and ended them poorly. But, truth be told, isn’t that the case with most long term relationships that end? They start going downhill & then one, or both, find someone else. Pretty garden variety stuff. I don’t condone the lying, of course. The only “right” way to deal with a breakup is to actually breakup first before exploring anything else. But truly how many relationships ending are that pure? Even then, will the ex really feel a lot better that they got dumped “honestly”? Probably they’d still feel like they were blindsided & would still be bitter. I don’t recall too many “ideal” breakups that I experienced. They were just different levels of bad. There were always hurt feelings & drama. I accept that Rajahs is a player & is a terrible boyfriend. I don’t see anything long term with JoJo and him. I think that’s pretty obvious. But, on this show, is that really news at this point? It’s not like this show attracts a lot of boy scouts and real love stories. And the show is built around drama and conflict with a fake love story construct to hold everything together. Yawn. Either there’s not much there or RS is holding back on the good stuff. Sorry but they are both creepy and Jordan looks so gay!